The new Hape Double Loop Railway set is the ideal gift for little ones who love both construction and trains. Children can build a complete Hape railway from the ground up with curves, bridges and even a station. 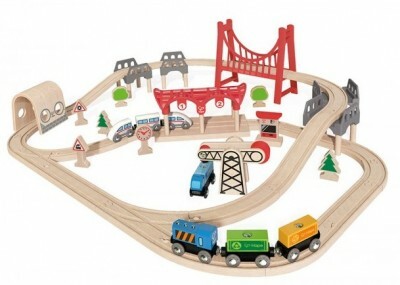 This Double Loop Railway set is a brilliant starter pack that will inspire playtime creativity and imaginative worlds. This set includes plenty of add on pieces, rails and trains that children will love to play with. Once children have created their railway track, they can also enjoy test driving the bullet train on their creation. My nephew spent hours designing and building his very own track and then loved using the train on his track. He was definitely entertained for ages! The Hape Double Loop Railway set is made from wood and metal and includes lots of brightly coloured bridges and stations making the set wonderfully fun and eye catching. There are 64 pieces in this set and they can be combined with other Hape railway sets so children can create even bigger and better railway tracks! The Hape Double Loop Railway set is a brilliant gift for children aged 3 upwards and will inspire their creativity and keep them entertained for hours. This fabulous set is available from www.amazon.co.uk for £49.99.